Waverly is two now, and quickly outgrowing nap time. I can handle that, but the problem with both our kids that they still need nap time, they just won't allow themselves to sleep in the middle of the day. I know this because by dinner time they are cranky, ornery and defiant -- all things that do not occur when a solid nap is accomplished. So what is my retaliation? Let them have a 30-60 minute "quiet time" (a suggestion from another dad on the podcast I got to take part of), and then a car ride. 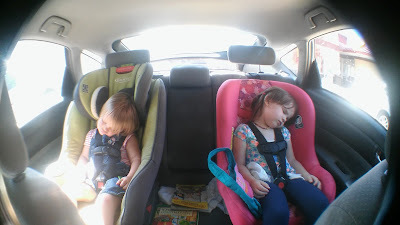 Want proof they still need a nap besides the aforementioned behavior? They are usually both sleeping within three miles. And so I drive around a bit, wasting gas and destroying the environment, and then park in my driveway and write some on my laptop until Ellie usually wakes up screaming. I guess she is bewildered or uncomfortable or something, but she often wakes up from these car naps with an outburst of "Dad, go!" or maybe just an outright yell. It is kind of funny, but usually wakes up Waverly, who would have slept another fifteen or twenty minutes probably, if given the time. The first time I tried this method was a few months ago actually, when the nap time disappearance was first occurring. I drove to a McDonalds to get some coffee, and then opted out of the coffee when it was $2 for a pretty terrible cup (I think I expected a $1 deal). Next I drove to a nearby skatepark and watched some kids rip while I waited, hoping the metal didn't wake up the girls. It wasn't half bad (though it made me want to go skateboarding instead of sit in the car), and kind of worked well for the girls. I also discovered a cool neighborhood across the highway I never knew existed, though again, wasting gas and destroying the environment. Yes, this is the latest in an ongoing drama of attempting to get sleepy children to succumb to sleep. I would like to say this is the finale, an anticlimactic battle in a not-so-entertaining movie, but I think it is more likely a "to be continued..."
I spent the last year and a half complaining about the city I live in. This is following up seven years of complaining about the city I miss, wishing I was in the city I am currently in. I have complained about it being too hot, buggy and humid whilst missing the cool desert air of California. I have complained about it being too sunny, cloudless and perfect whilst missing the weather of the east coast. I have spent alot of time complaining about having no waves in South Carolina, while complaining about living too far from the beach or too much traffic while in Los Angeles. It is a high of 77 degrees today as I write this on December 5th (I'm a little ahead on publishing these blogs), which is actually really nice weather, but just doesn't really fit the Christmas season, which I love. I am very tempted to complain about this, but you know what? I think I may be done complaining. After spending the last eight or nine years trying to find a perfect place to live, I think I am coming to terms with the fact that it does not exist. Even if it does exist, it is probably very far from my family, which would take a severe level of joy out of living there, therefore making it less-than perfect. So from here on out I am going to try really hard to just accept where I am with the peace and joy that God provides, and press on towards another day and a brighter future. "Choose joy," my friend often tells her three year-old, but the mantra applies heavily (even more so) to us adults. I know I can be pretty bad at not complaining, having spent the majority of my life encapsulated in its burdensome walls. But it won't stop me from trying! It brings to mind this nice song by Ingrid Michaelson, which we can all sing together when the greasy fingers of discontent try to squeeze a little negative verbiage out of our throats. Words are powerful, and can be even more so when sung. A few days before the big due date, I ran into some parents with similarly aged kids in a different preschool. 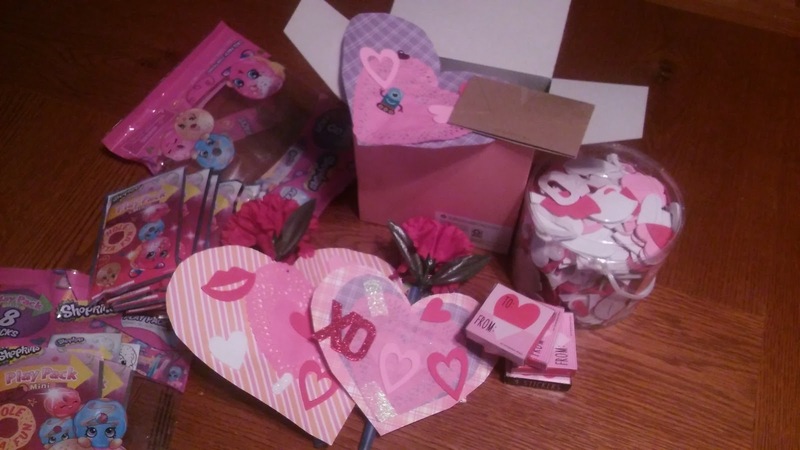 They explained how their daughter's class had gone all out with valentines, spending lots of money and leaving the homemade crafts they had made at the bottom of the barrel. "And Christmas presents for teachers..." they lamented, "Forget it! Parents were spending $20-$30 on gifts!" My eyes got wide as I gazed into the future of pressured giving. Not that I don't want to be generous with my kids' teachers (I'm married to a teacher after all), but there has to be a line when you have 3-4 teachers, right? I'm not trying to be stingy. I think to me the whole problem with all of it is that these are simply societal pressures, which I'm not sure we're meant to adhere to. This isn't the first time we've experienced this obviously; even as parents, you're told what to do with your child before he or she is born. You then spend the next three or four years learning to ignore those pressures, and just when you start to get a hang of it, your kid goes to school and a whole new set show up. Dance lessons, uniforms, instruments, private coaches...I foresee a future of heavy spending on things that don't really matter, mostly to keep my kids competitive with their peers; to keep them from being the "weird kid." But what's wrong with that? I think weird kids change the world in ways normal ones don't, and maybe can't. In hindsight, our massive tendencies to be normal hinder us from embracing what makes us special, and even though I can see how little "normal" actually mattered in middle school, as an adult I still struggle with it. I'm growing of course -- I mean, I'm a stay-at-home dad in the South who still skateboards and tries to write stuff for a living; how could I not get good at being different? But it still a pushing against the tides of culture and will inevitably be difficult at times. I handed the Valentine's Day project over to my wife, who is infinitely more crafty than me. (Though I did try my hand at a couple valentines...and they were terrible compared to hers!) She showed up with beautiful handmade valentines that were fabulously received. It did cost a little more money than I would have liked to spend on something that will likely be thrown away before the week's end, but I was proud to not have a generic, store-bought superhero or Disney character valentine with a taped on lollipop (no judgement if that's what you made). Cleaning up toys has long been a battle in our household. I have a vivid memory of a one-year-old Ellie throwing the most massive tantrum she ever had over not wanting to pick up her things. Crying and flopped down in the hallway, she relentlessly held on to her conviction, whether or not it was valid. Now I have volunteered in enough K-6 Sunday school classes to have a healthy dose of distaste for when kids don't pick up after themselves. 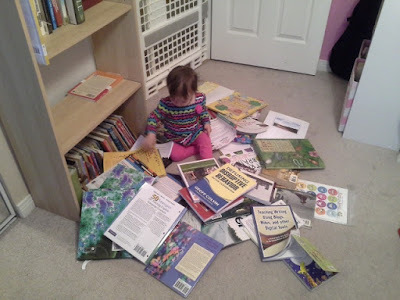 "That's not my mess," is the most common excuse for laziness -- and so I fervently want to instill a sense of personal responsibility in my own kids, which is easier said than done. "Waverly made that mess," Ellie told me, to my chagrin. "I don't care, you played with them too so clean them up or I am giving them away." Threatening to toss toys works pretty well as Ellie suddenly freaks out and loves dearly any item headed for the trash can. (I can't say I enjoy this toddler materialism in her, but we will fight one battle at a time...) She cleaned a little, then piddled about. I gave one more warning (I give too many warnings). She did the same. "Okay, that's it. Puzzle is gone," I said as I proceeded to silently put all the pieces in a bin and take them away. Tears and begging ensued, but I had had enough. The problem with instances like this is that you always doubt yourself as a parent. Am I scarring my child? Will she even remember she has a puzzle tomorrow? Is this helping? Thoughts like this usually soften my heart and I give one more chance, but not today. In minutes the puzzle was gone and Ellie was on the floor in the hallway crying. I let her work through it for a couple minutes before I hugged her and ensured that it is indeed very sad to lose toys (a Love and Logic thing). We talked a bit and she calmed down. And then, after it was all over, something changed in her. She was kinder, cared more, cleaned well and led Waverly in doing the same. She knew I was finally serious about getting rid of her precious toys, and the threat fulfilled actually worked! Also, the struggle we went through together seemed to bond us, like two kids who get in a fight at school and are best friends after it's all over. I wanted to share this with you, parents (or not), so that if you are afraid of harming your children with some discipline -- don't be. That feels a little silly writing it out, as if I am a total pushover parent (I hope not). But I want to encourage anyone else who goes through internal doubt that your harsh reactions can reap benefits beyond the trials. Follow your instincts and know that it is your job to do so, motivated by love, resulting in a child that becomes a productive member of society...and picks up her toys. I went to our most frequented park recently for a rare afternoon playtime with the girls. A different crowd populates the park in the early evening, so I was seeing another side of our all-too-familiar play place. Most notable was a boy on a massive electric four-wheeler and his dad on a smaller scooter, zipping in like a tiny gang of cowboys. The girls kept playing, but eventually caught sight of the vehicles and came over to ask, "Daddy, can I see that boys truck?" I had an immediate flash-forward to a teenage Ellie asking to go for a ride in an unknown adolescent boy's giant pickup truck, and suddenly broke out into a cold sweat. The idea of her hanging with boys is a strange one, but something I must get used to nonetheless, and so I said, "Sure." Like a good father, though, I went over to meet the boy behind the truck, and his father who obviously paid for it. 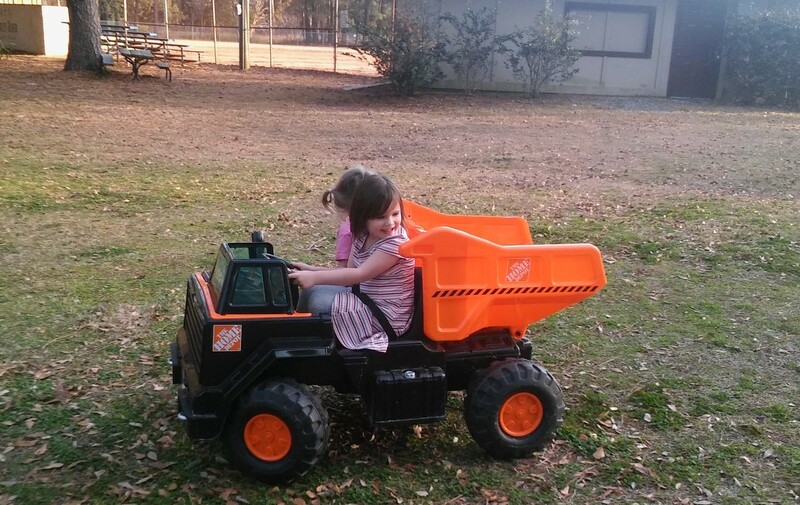 The kid ended up being super nice, and let Ellie and Waverly ride around in the Home Depot dump truck for a long time; long enough to probably kill the battery (I hope they made it home). Meanwhile, the boy showed off on his super cool powerslide trike, kicking around grass like it ain't no thang. I talked with the dad and he was a nice guy about the same age as me. The conversation turned to where we lived, housing and his neighborhood verses mine. "We love our neighborhood," he said, "Nice, quiet, safe...all white." He leaned in a little and got quieter for that last part. I didn't quite know how to react or respond. My eyes probably got wide as I tilted my head back in a little gesture of surprise. He quickly moved on, probably gathering that I didn't exactly share his views. The rest of the conversation went pretty normal, but as the evening progressed I couldn't stop thinking about that phrase, "All white." That night Katie and I watched Comedians in Cars Getting Coffee, which is a show on Netflix we've been getting into that I just love. The episode we watched had Trevor Noah, and in it he described what it was like growing up in Apartheid. Not that long ago (within my lifetime) he suffered under extreme racial segregation, to the point that his parents (a biracial couple) had to hide their love for each other from the government. As we watched, I couldn't believe that something like that existed in recent history (though I'm sure it still exists in many parts of the world). But then I thought back to the "all white" guy I had just met, and decided that as long as people maintain ideas like that, racism will inevitably carry on. During our conversation, as he and I had compared neighborhoods, mine having gone through some gentrification over the past fifteen years or so, he told me a story of how he used to lifeguard at the public pool on my road, a "black" park in a "black" neighborhood. He told me that in his first week of working there as an impressionable teenager, he had two stabbings come into the pool from the locals on the adjacent basketball court. I'm sure this experience of seeing what happens in such a neighborhood, coupled with some familial imposition, helped to solidify his current racist views. Having grown up seeing some of the same things, I can understand where it comes from.